Today marks the first in a monthly series of party planning posts. On the 15th (or thereabouts ) of every month I'll be posting some fun themed party planning posts. Since this month's stamp of the month is "Ice Cream dream" it totally made sense to plan an "ice cream party" for June. To plan a party, you need an invitation! Cut your red cardstock for a standard size card (8.5 x 5.5 inches.) Fold in half. Use a corner rounder to round edges. Cut circles in 1.25 inch (1 1/4) size with either a punch or cricut. Cut a rectangle from the middle of the front of your red card (OR just cut a rectangle and adhere to the front of the card.) The size of your rectangle should be 3.25x 4.5. If you cut the rectangle OUT of the red, back with a whisper cardstock in 4x5.25 size. 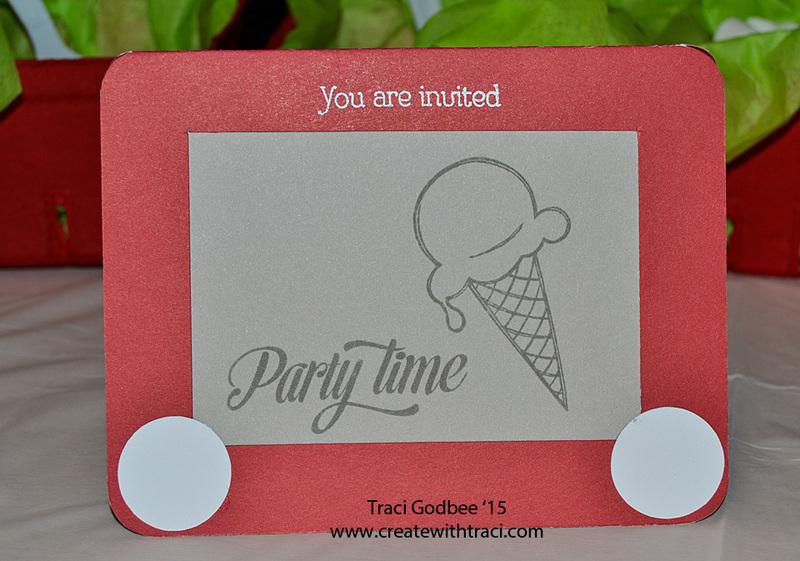 Use slate ink to stamp "party time" and an ice cream cone. At the top of the card, in versamark ink, stamp "you are invited". 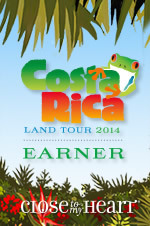 Add white embossing powder to the words, brushing off any excess. Use a heat gun to melt and set the powder. Add party details to the inside. I'm a busy mom, so I choose to mix "store-bought" with "hand made". 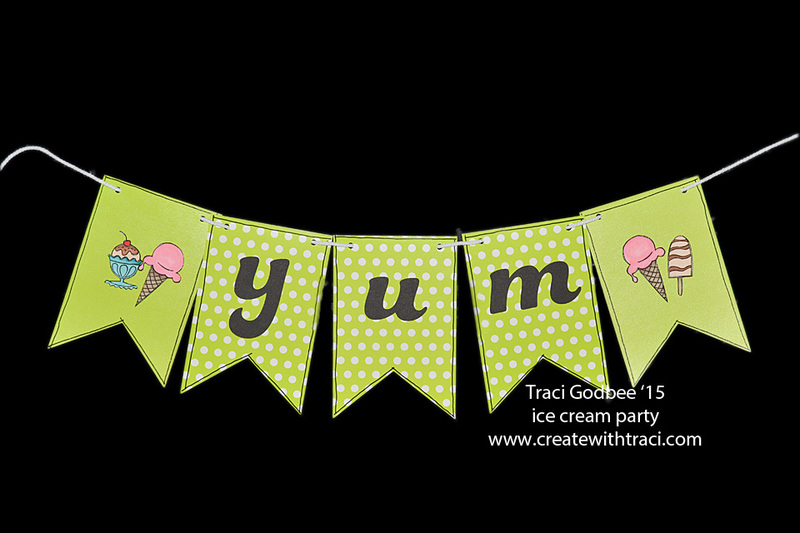 For instance, I could have cut this green banner from our pear cardstock using one of our great Cricut collections. Instead, I found this green banner with about 9-10 polka dot banners (the solid green is the back side of the banner) on clearance at Target for about $1.50. 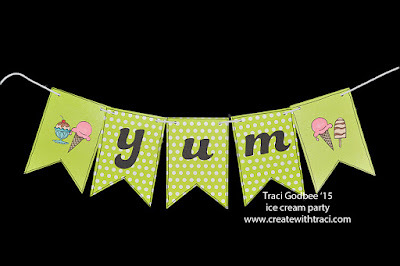 I simply cut "yum" from black cardstock using Cricut Artbooking. I stamped a few ice creams from our Stamp of the Month and colored with our shinhan markers. I added a black border on each banner flag with our black journaling pen. I found these Strawberry baskets at Michaels- 10 to a pack on clearance at Michaels right after the new year... for under $2. I used 3, along with some pear green tissue paper to tie my colors together. Each was filled with some "loose" toppings like marshmallows, chocolate chips and peanuts. The spoons were decorated with 3 strips of Ruby red Washi tape at the ends. 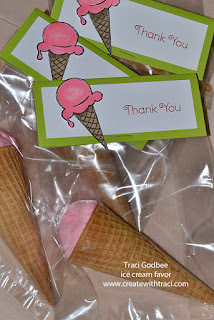 Create some "ice cream" treats with sugar cones and cotton candy. I found the cotton candy at the Dollar Tree and hit a big sale at our local Meijer- a box of sugar cones for $1... yeah! Pear cardstock, white cardstock and some shinhan markers with the Teacher Appreciation stamp set to write "thank you". I topped it off with the ice cream cone to coordinate with my invitation and banner from the Ice Cream Dream stamp set.